Every year, the number of devices requiring greater bandwidth to remain reliable and well-connected increases. The Hirschmann BOBCAT Managed Switch is built to help manufacturers keep pace with this change and build next generation networks. The switches support the new IEEE 802.3bz standard with 2.5 Gigabit speeds to bridge the gap between 1 Gigabit and 10 Gigabit speeds. Legacy devices or networks can be connected with 100 Mbit/s, 1 Gigabit uplinks for current networks or 2.5 Gigabit for future-proof networks. The BOBCAT switches support all speeds by replacing the SFP in the field. The switch is also the first of its kind to enable real-time communication using time-sensitive networking (TSN). 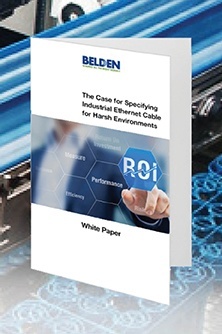 Industrial applications require this capability to maximize performance and security, even under the most demanding conditions. Learn more about our new Hirschmann BOBCAT switch that supports the IEEE 802.3bz standard and works at 2.5 Gigabit speeds, perfect for industrial applications. Flexibility - Available in standard configurations ranging from 4 to 26 port, with both copper and fiber ports, Gigabit and 10/1000 speeds and in managed and unmanaged configurations, theses switches offer the ideal mix of flexibility, horsepower, and value. Ease of Installation - There is no need for additional documentation, standard procedures, or operator training when RS20/30/40 switches are installed in the same network as other Hirschmann products because they use a common firmware as other Hirschmann products allowing networks to easily evolve and change. Download this application note and learn about different types of antenna technologies and their typical uses.